You'll be £28.00 closer to your next £10.00 credit when you purchase Italian Naval Camouflage of World War II. What's this? At that time all the principal warships were painted in a light matt grey (‘grigio cenerino chiaro’), which had been adopted in the 1920s and early ‘30s. With the advent of War, and the start of convoy traffic to Libya, the need to camouflage ships for purposes of deception, rather than outright concealment, became apparent and the first initiatives were undertaken. In the first part of the book, employing contemporary schematic drawings, photographs and his own CAD profiles, the author describes the development of the varied schemes that were adopted for the capital ships, such as Caio Duilio and Littorio, cruisers, destroyers and torpedo boats, landing craft and merchant ships; even the royal yacht and small tugs were given camouflage schemes. 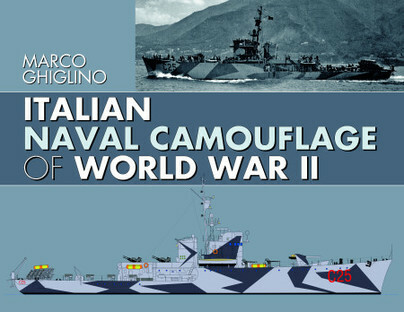 In the second, and longest, part he depicts all the ships and their schemes, at different dates, with both sides of a ship shown where possible, in his own beautifully rendered schematic profiles, all in full colour, and it is this section with more than 700 drawings that gives the reader a complete and detailed picture of the whole development of Italian naval camouflage. He also looks in detail at the Greek theatre where there were many exceptions, influenced by the German presence and by the camouflage schemes of captured vessels. This major new reference book will prove invaluable to historians, collectors, modelmakers and wargamers and follows in the wake of the hugely successful Seaforth editions covering German and British camouflage schemes of the Second World War. An impressive work, wonderful and essential for both historians and modellers or players of wargaming naval. This is a great book, particularly if you like looking at pictures of ships, all of which contain detailed captions with interesting snippets of information. It is a major contribution to the reason for any application of camouflage at sea, its use by the Regia Marina and is strongly recommended for the expert, modeller and naval wargamer alike. Any modeller countenancing an Italian warship project should consider this as a key reference. A book of great interest for English-language readers but, at the same time, we believe that it can also meet the favor of the most passionate Italian readers as well as of the most skilled modellers, for which English language certainly does not constitute an insurmountable obstacle, especially in a work in which the iconographic aspects are clearly dominant. While this is obviously a niche subject, it's done impressively well. I really like this as a reference which is great to see in an English language book, adding so much more to available references on warship camouflage, this time for the Italian Regia Marina (Royal Navy). Heartily recommended. I’m convinced this deeply researched and beautifully presented, book will become the definitive reference source on the subject, for historians, collectors, model makers and war gamers. Marco Ghiglio is a serving officer in the Italian navy and has been researching naval camouflage for many years. He is an accomplished draughtsman and this is his first book.